How to upgrade T-Mobile Note 4 to Android 6.0.1 Marshmallow latest firmware update? Leave a Comment on How to upgrade T-Mobile Note 4 to Android 6.0.1 Marshmallow latest firmware update? Finally, the T-Mobile variant of the Samsung Galaxy Note 4 SM-N910T is being updated with Android 6.0.1 Marshmallow firmware. This is the first Android M build and comes with the firmware version N910TUVU2EPE3. We have seen a similar update for other US carriers like the Sprint Note 4 N910P, Verizon Note 4 N910V, AT&T Galaxy S6 and Note 5, etc. This is a great deal for all the T-Mobile users waiting for this stunning update and running the older Android version 5.1.1 Lollipop N910TUVU2DOK2. Check out the screenshots from our Pinterest account. The new update as we know brings many features including the Google Now On Tap, granular permission controls (App permissions), Doze Mode, and that the surprising new emoji. We have already listed the new Emoji 9 and 10 updates on this tutorial that fo along will all the Android versions. So if you have not yet received the update, then head over to your device’s software update option from settings. If not then grab the update from below. Firmware details: Model SM-N910T, Model name GALAXY Note4, Country USA (T-Mobile), Version Android 6.0.1, Changelist 7804088, Build date Fri, 13 May 2016 12:29:19 +0000, Security Patch Level 2016-05-01, Product code TMB, PDA N910TUVU2EPE3, CSC N910TTMB2EPE3. July 2017 Security update for Galaxy Note 4: Firmware builds for Galaxy Note 4 N910H N910G N915F. Before you proceed to the download section, you can either download the firmware directly from Samsung with a new tool without any speed restrictions or subscription from the first link or get it from third party websites from link 2. → Download | Faster download method without bandwidth restriction. You may also like Samsung Galaxy S7 Edge ROM Apps and Features for Note 4. What’s New with N910TUVU2EPE3 T-Mobile Note 4 Marshmallow Firmware? – The new TouchWiz provides enhanced usability and an updated Visual design. – Quick connect helps you easily find and connect to nearby devices by showing the currently connected devices and previous connections. – Fingerprints are securely protected. An alternative unlock method (pattern, pin, or password) is required to add fingerprints. – Advanced power saving mode restricts background data and extends battery life. – A new vibration pattern concept has been applied. * Before OS 6.0 upgrade, please be sure to update the Samsung gear to the latest version. * Android 6.0 Marshmallow does not support the Decrypt device function. If your mobile device is encrypted, encryption cannot be disabled after upgrading. If you want encryption to be disabled after upgrading, it must be disabled before you upgrade your device. To disable encryption go to Settings – Lock screen and security – Other security settings, then select Decrypt device. * Some apps that were installed via the Lollipop OS may need to be updated after upgrading to the Marshmallow OS. Go to Galaxy Apps or Play store to update Apps. * If present, the Email shortcut on you home screen will be removed during the upgrade. It can be added to the home screen again after upgrading. * Some changes may vary depending on the country or network operator. * The functionality of some features may differ after the upgrade. Some apps may not function normally. * Errors during the upgrade may cause data loss. Back up any important data before upgrading. 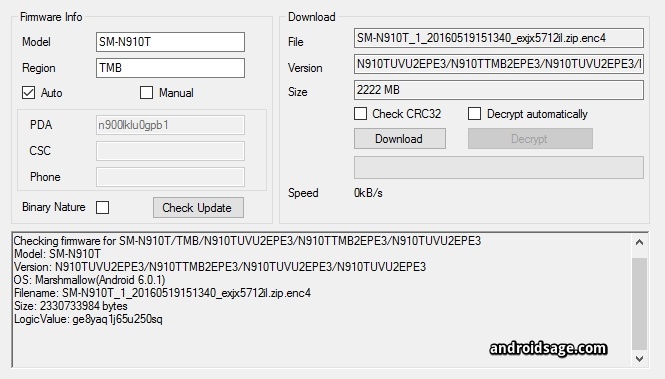 How to Install Android 6.0.1 Marshmallow Firmware on T-Mobile Note 4 N910T? In order to upgrade or install the firmware file, download the firmware file from above and head over to our detailed Odin installation tutorial for Samsung device: How to install Android 6.0.1 Marshmallow on T-Mobile Note 4 with Odin? via Odin. The installation procedure is same for almost all Samsung devices if you are flashing the stock Samsung firmware. Upgrade your Samsung Galaxy Note 4 to Android 6.0.1. Fix boot loop and force closes. Restore/Revert back to Stock on your Galaxy Note 4. Unroot or remove custom recovery like TWRP from T-Moblie Note 4. Follow and like us on social media. For queries, comment down below or leave a message in the forums.